Quite a number of people, who go on to get their Private Pilots Licence for Helicopters, PPL(H), start off with a trial flight using a gift voucher given to them by family or friends and then get bitten by the Helicopter bug! It is only when they start looking more deeply into the next steps they need to take to make their dream come true do they realise what is involved and how expensive it can be. Can you afford to pay for the course or will you need to take out a loan? With regular lessons it typically takes the average person about 50-55 hours to qualify for the PPL (H) and you will have to budget between 12-16 thousand pounds! The time and cost will vary depending if you are taking a full or part time course. You are more likely to make better progress on a full time course than only taking a couple of lessons a month. Can You Afford to Fly Once You Have Got Your Licence? Think very carefully and be honest with yourself about this point before going any further. Typical hourly hire rates for a Robinson R22 are around £175 to £220 + VAT, and you will have to hire a larger and more expensive helicopter if you are too heavy fly it! And don't forget that landing fees can be quite expensive at some locations as well. It is very important to know, before any steps are taken in getting your PPL(H), if you meet the required medical standards for this type of licence. There would be nothing more disappointing to find out after starting the course that a, hopefully, relatively minor medical condition stops you from obtaining a licence. This will typically cost upwards of £120 and this can be done by any UK CAA approved Aeromedical Examiner (AME). Depending on your age these test need to be carried out at regular intervals and failing one will stop you flying solo! Locality of the school in the UK - Is it close to home or do you have to travel long distances and/or time to get to it? This affects your physical and mental state as well as providing additional transport cost to the price of training. Cost of the school - Is it affordable or would it be better value to train somewhere outside the UK such as the USA? The instructors- Do you like the instructors? It is important that you meet, talk and possibly fly, with the instructors that may be teaching you to see if you will both get along with one another during the period of your training there. After receiving a thorough ground briefing about the flight, flight safety, instruments and use of controls the instructor will take you out to the helicopter. 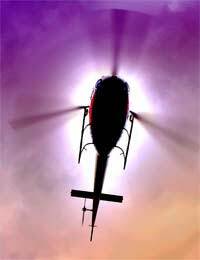 The type of helicopter used for this flight, subject to weight conditions, will typically be a Robinson R22. You will be asked to get into the cockpit and shown how to safely strap into your seat, followed by a short refresher briefing on safety, the location of instruments and controls. On a 30-minute trial flight the instructor will fly you back to the airfield and carry out a debriefing. On a 60-minute trial flight the instructor will fly you back to a safe point on the airfield and demonstrate, instruct then allow you to attempt to hover the helicopter-which is not a simple task, followed by a debriefing. After the trial flight you will probably feel exhausted and the helicopter bug may have bitten you even deeper! The attraction and advantages of flying a helicopter is obvious and the choice to fly these or fixed wing aircraft is a personal choice. Whilst flying helicopters offers its own unique advantages it is tempered by the relative high cost to that of flying fixed wing aircraft. Now it is up to you to choose which!